How can I sync FullContact for iOS with my iPhone/iPad’s native Contacts app? 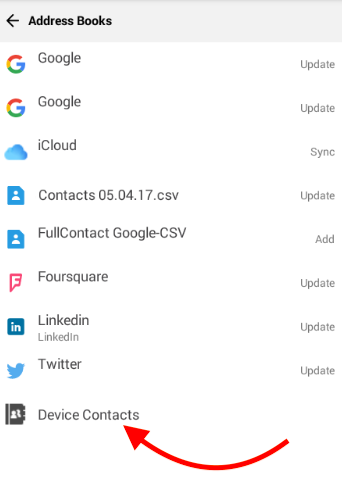 How can I sync FullContact for Android with my Android's native Contacts app? How can I sync FullContact with my Mac's native Contacts app? Why are duplicates appearing in my Mac's native Contacts app? Why am I not seeing some of my local contacts in the FullContact for Mac app? I use (or want to use) CardDAV to keep FullContact synced with my Apple device(s). 1. Create a FullContact account here. 2. Connect Google Contacts, iCloud contacts, or your Exchange/Office 365 address book. 4. Enable iCloud/Google/Exchange as your *only* contact source on your devices. By doing so, you'll alleviate seeing duplicates in the native Contacts app on your smartphone. 5. Settings -> Contacts (iOS 10 and newer) / Mail, Contacts, Calendars (iOS 9 and older) -> Accounts - enable only iCloud, Google OR Exchange access to Contacts. 4. Android Device Settings -> Accounts & Sync -> Connect your Google account that is syncing with FullContact. You have to go to your FullContact for Android app's Settings tab and tap on Address Books -> Device Contacts and choose any of the sources available there. You will be able to choose to connect your Google account, or to enable device contact sync through one of your other apps (i.e. Whatsapp, Viber, Yahoo etc.). To make sure that your WhatsApp contacts are synced to your Android device contacts, follow these instructions here. To make sure that your Viber contacts are synced to your Android device contacts, tap on the menu icon in the Viber app -> Settings -> General -> enable "Sync Contacts". 5. System Preferences -> Internet Accounts -> connect iCloud, Google or Exchange and allow access to Contacts. You likely have multiple sources showing. 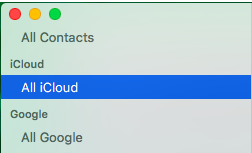 Open your Mac's Contacts app -> click View -> click Show Groups -> enable only one contact source (for example, only 'All Google', 'All iCloud' or 'All FullContact'). If you have questions or concerns about CardDAV, please email our Support team from our Help Center's home page.